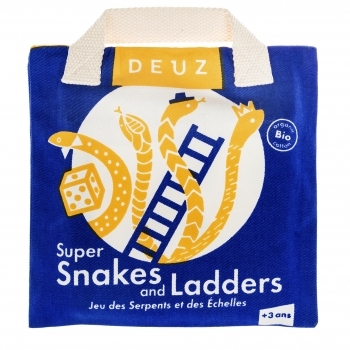 Their motto stands for itself; 'With Deuz it’s time to play!' Deuz celebrates childhood. 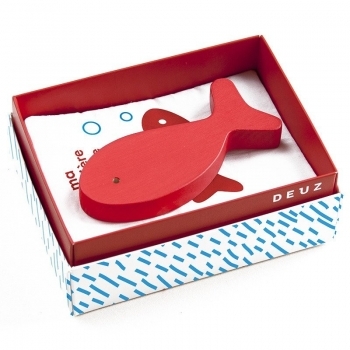 This French brand loves to create practical, beautiful and smart toys that let children’s imagination grow. 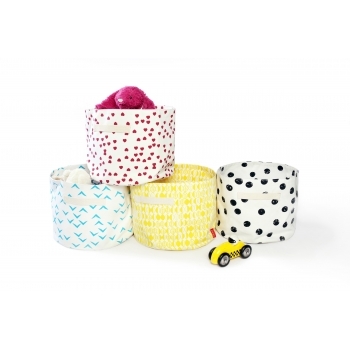 And the colorful designs of their decorative objects will definitely be an eyecatcher in your kid’s room. ABC… easy as 1,2,3 ! 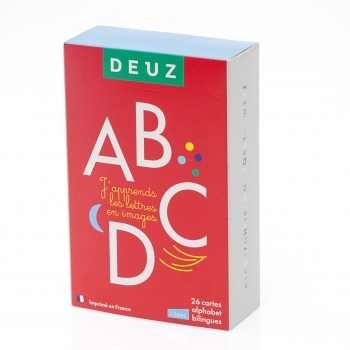 These bilingual French/English letter cards are a great way to get to know the alphabet. The cute illustrations will help your little one learn the ABC super fast. 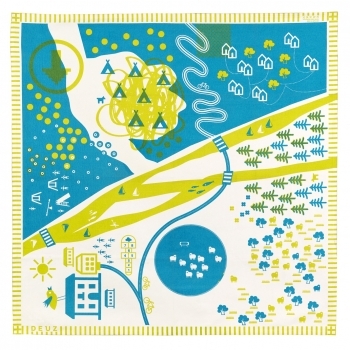 From the North Pole to the Savannah… This colorful playmat is a wonderful way to encourage children’s imagination. You can easily pack the mat into their small bags and can be used indoor as well as taken to the park. 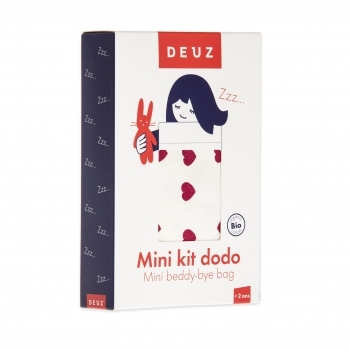 This mini beddy-bye bag with black dots for dolls and teddies is the perfect gift when your kid loves putting them to bed. 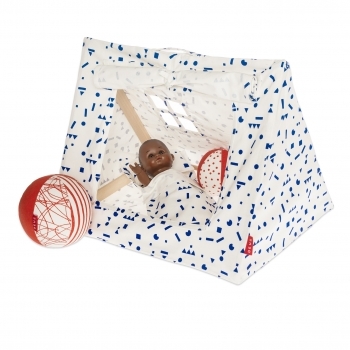 It has a sleeping bag and a pillow and will become one of your kid's favourite toy accessory. Available in different colours. The perfect hideaway for your little ones. The tent is printed with black dots and ideal for playing, hiding or to take a short nap inside. The tent is easy to set up and comes with its own storage bag. 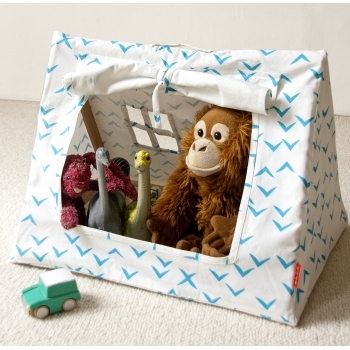 Hide your teddy bears or put your dolls to sleep in this lovely toy tent. It is easy to carry and the assembling will be done in no time. 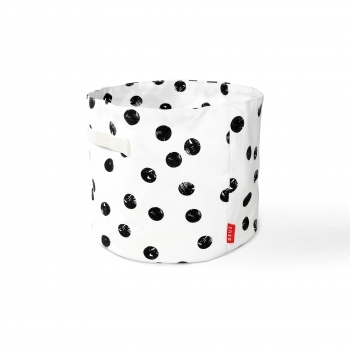 The mini tent is printed with black dots and comes with its own storage bag. Use it in the tents or as a playmat for your kid. 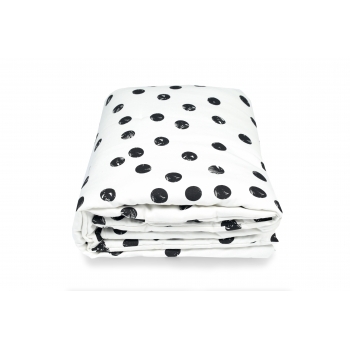 They will love to spend their reading time as well as their nap on this super cozy black dotted mat . The perfect companion from birth on. 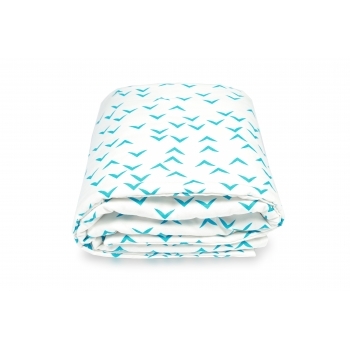 The mats are made of organic cotton and printed with non toxic inks. Made in India by a fair trade company. Other colours and stiles available. 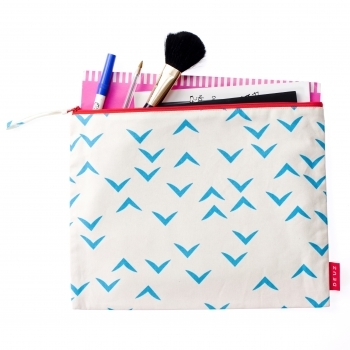 In this blue birds large sized case mommy can pack all her essential nursery items or you can use the pouch as a vanity bag. Kids can put their favourite small toys in it. So the perfect allrounder. 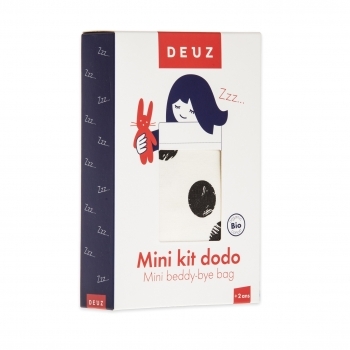 This mini beddy-bye bag with blue birds for dolls and teddies is the perfect gift when your kid loves putting them to bed. 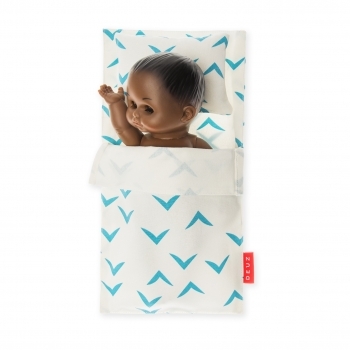 It has a sleeping bag and a pillow and will become one of your kid's favourite toy accessory. Available in different colours. 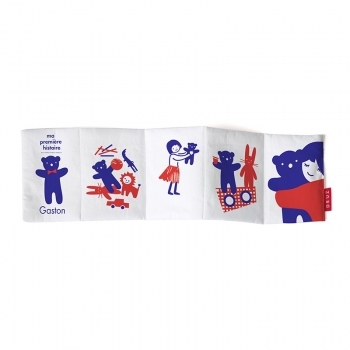 In this blue medium sized case mommy can pack all her essential nursery items or you can use the pouch as a vanity bag. Kids can put all their pencils in it. So the perfect allrounder. 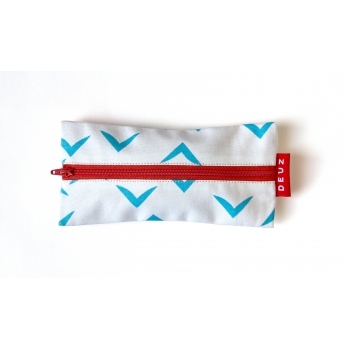 This small blue case is perfect for your kids to store pencils but also to hide smaller toys and other treasures. They will love to take the case everywhere with them. 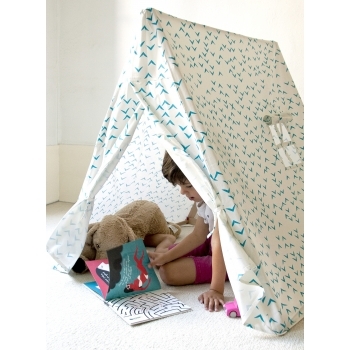 Tents are the perfect hideaway for kids. The blue angles printed on the tent look like a flock of birds. Play, hide or take a nap inside. The tent is easy to set up and comes with a storage bag. 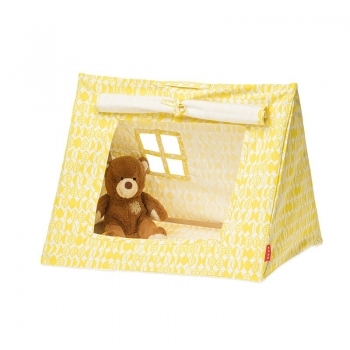 Hide your teddy bears or put your dolls to sleep in this lovely toy tent. It is easy to carry and the assembling will be done in no time. 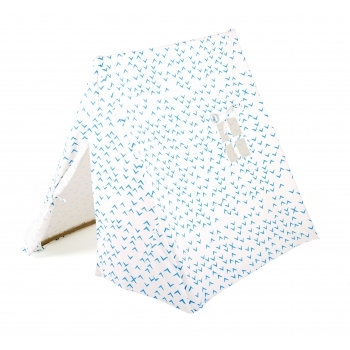 The mini tent is printed with blue angles and comes with its own storage bag. This mini beddy-bye bag with blue stickers for dolls and teddies is the perfect gift when your kid loves putting them to bed. 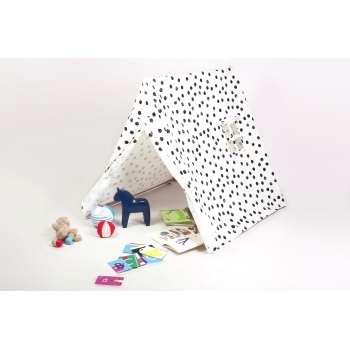 It has a sleeping bag and a pillow and will become one of your kid's favourite toy accessory. Available in different colours. 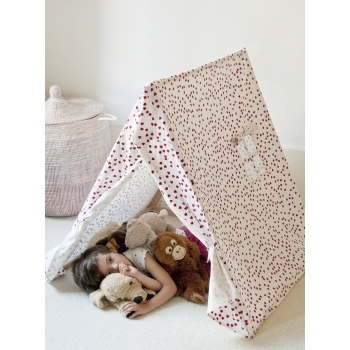 Hide your teddy bears or put your dolls to sleep in this lovely toy tent. It is easy to carry and the assembling will be done in no time. 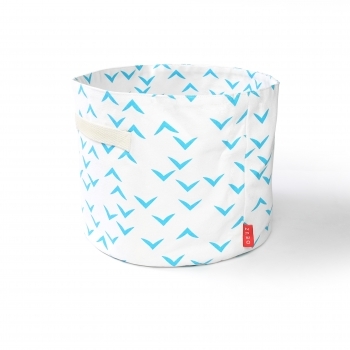 The mini tent is printed with blue stickers and comes with its own storage bag. Use it in the tents or as a playmat for your kid. They will love to spend their reading time as well as their nap on this super cozy blue mat. The perfect companion from birth on. 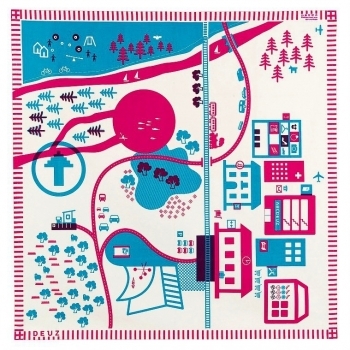 The mats are made of organic cotton and printed with non toxic inks. Made in India by a fair trade company. Other colours and styles available. 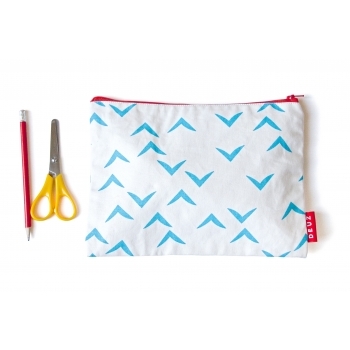 In this red medium sized case mommy can pack all her essential nursery items or you can use the pouch as a vanity bag. KIds can put all their pencils in it. So the perfect allrounder. 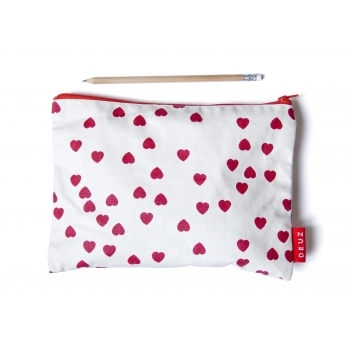 This small red case is perfect for your kids to store pencils but also to hide smaller toys and other treasures. They will love to take the case everywhere with them. The perfect hideaway for your little ones. 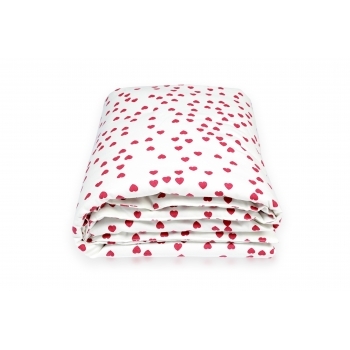 The tent is printed with red hearts and ideal for playing, hiding or to take a short nap inside. The tent is easy to set up and comes with its own storage bag. 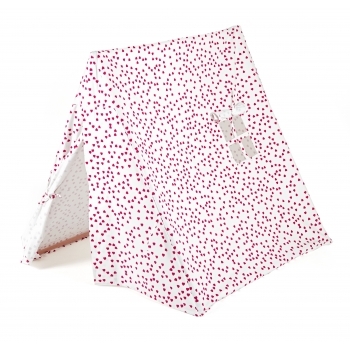 This mini beddy-bye bag with fuchsia hearts for dolls and teddies is the perfect gift when your kid loves putting them to bed. 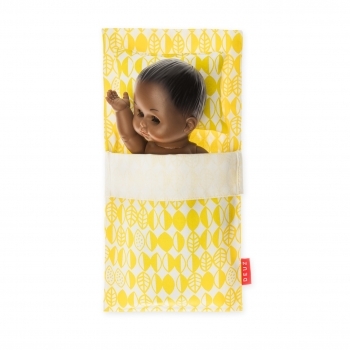 It has a sleeping bag and a pillow and will become one of your kid's favourite toy accessory. Available in different colours. 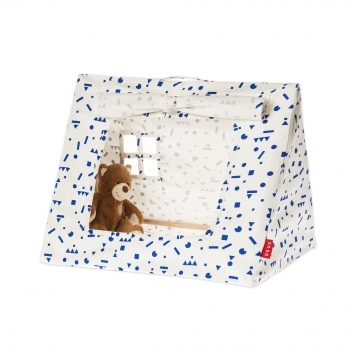 Hide your teddy bears or put your dolls to sleep in this lovely toy tent. It is easy to carry and the assembling will be done in no time. 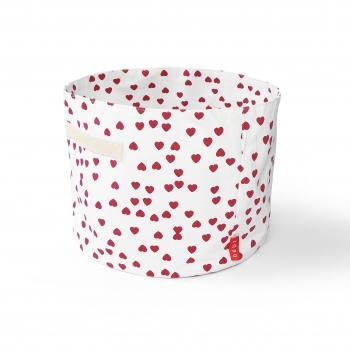 The mini tent is printed with red hearts and comes with its own storage bag. Use it in the tents or as a playmat for your kid. They will love to spend their reading time as well as their nap on this super cozy red mat. The perfect companion from birth on. 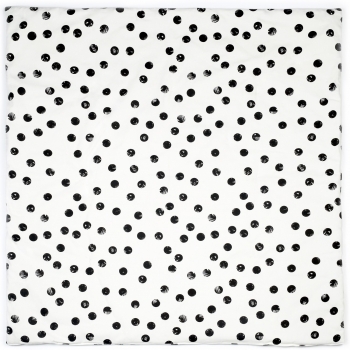 The mats are made of organic cotton and printed with non toxic inks. Made in India by a fair trade company. Other colours and styles available. A gorgeous set of 3 rattles designed in France. Let your little one discover nice sounds and wonderful forms. 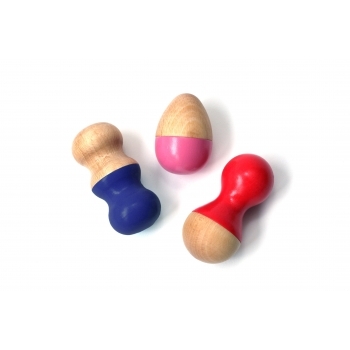 Each rattle has a different shape, sound and colour (lilac, pink and red) and fits well in the babys’ tiny hands. Gaston is a lovely little bear who loves to discover the world. Gaston is not only the main character of the story in this cloth book but also a wooden toy that comes with it. Léo is a happy little fish who loves to discover the deep oceans. He’s not only the main character of the story in this cloth book, but also a wooden that comes with it. Tired of the usual eating bibs? 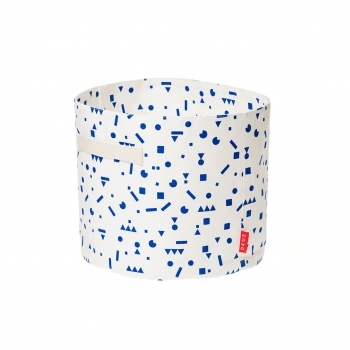 This blue and white striped napkin is perfect for little ones who want to eat like grown ups. 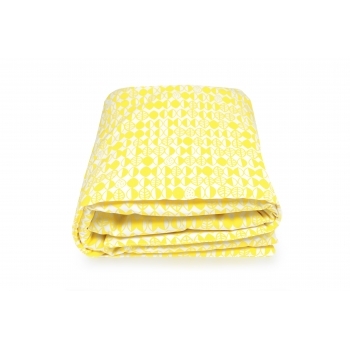 The napkins are made of organic cotton and printed with non toxic inks. Made in India by a fair trade company. It attaches around the neck with snap buttons. Other colours available. Tired of the usual eating bibs? 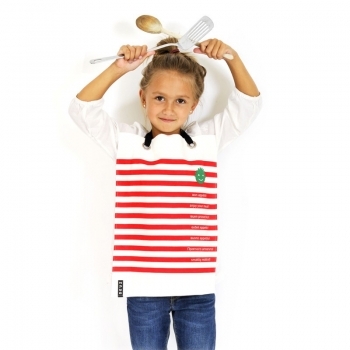 This green and white striped napkin is perfect for little ones who want to eat like grown ups. 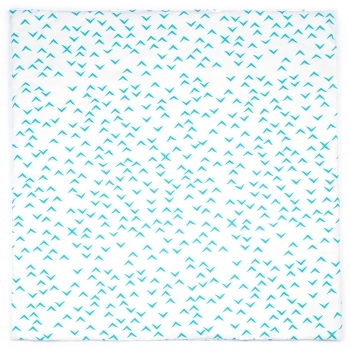 The napkins are made of organic cotton and printed with non toxic inks. Made in India by a fair trade company. It attaches around the neck with snap buttons. Other colours available. 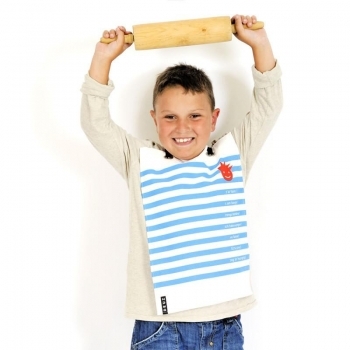 Tired of the usual eating bibs? 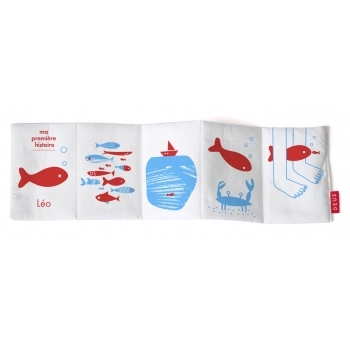 This red and white striped napkin is perfect for little ones who want to eat like grown ups. 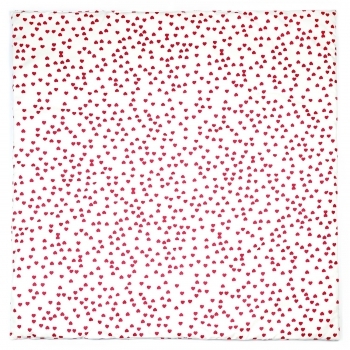 The napkins are made of organic cotton and printed with non toxic inks. Made in India by a fair trade company. 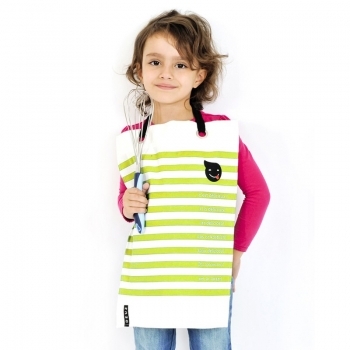 It attaches around the neck with snap buttons. Other colours available. 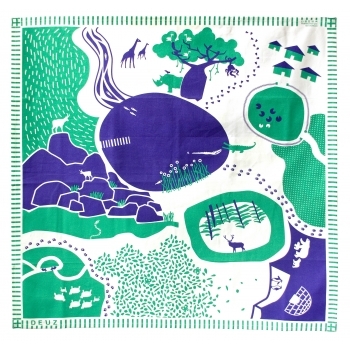 Visit the Indian Camp or raise sheep and take them into the woods… This colorful playmat is a wonderful way to encourage children’s imagination. You can easily pack the mat into their small bags and can be used indoor as well as taken with you to the park. 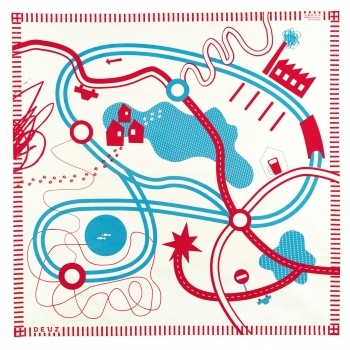 Want to take a long road trip with twists and turns and a lovely scenery ? 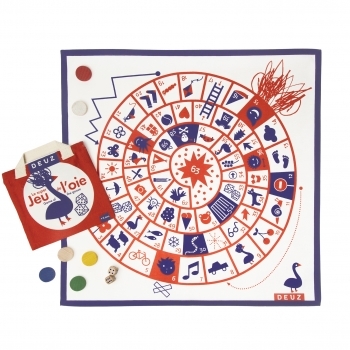 This colorful playmat is a wonderful way to encourage children’s imagination. You can easily pack the mat into their small bags and can be used indoor as well as taken to the park. 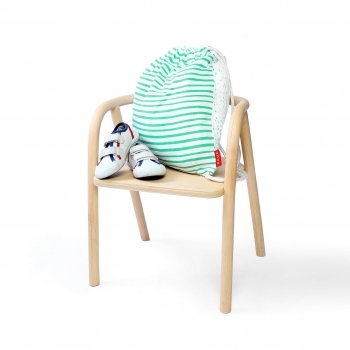 With this colorful organic cotton backpack, your kid can carry his lunch, sneakers, little sweater or his favorite Bunny. 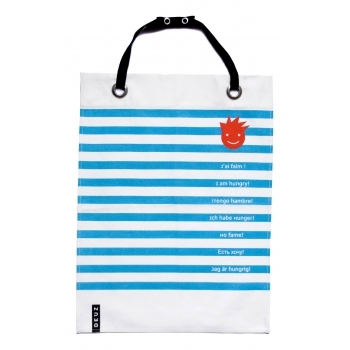 Printed with blue stripes on one side and blue dots on the reverse, it has a different style for each day! With this colorful organic cotton backpack, your kid can carry his lunch, sneakers, little sweater or his favorite Bunny. 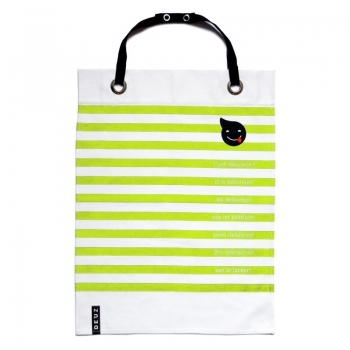 Printed with green stripes on one side and green dots on the reverse, it has a different style for each day. 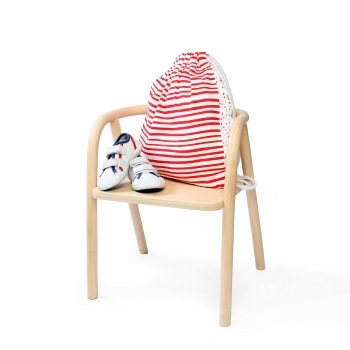 With this colorful organic cotton backpack, your kid can carry his lunch, sneakers, little sweater or his favorite Bunny. 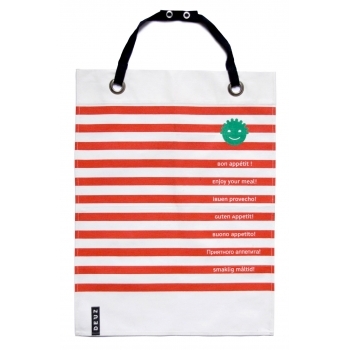 Printed with red stripes on one side and red dots on the reverse, it has a different style for each day! 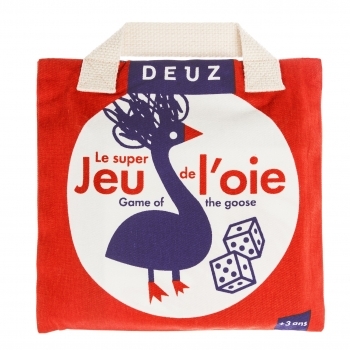 Printed onto organic cotton, the well-known 'Super Goose' game has been re-invented to be easily-transportable, kooky and eco friendly. Take care, as the dares on some squares will definitely spice up the game! Comes with rules translated into 6 languages. 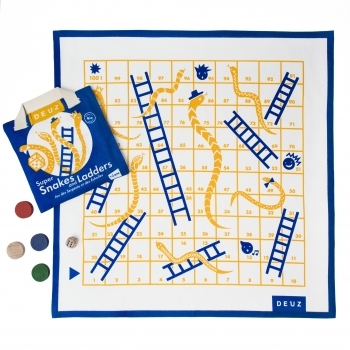 Printed onto organic cotton, the well-known 'Snakes & Ladder' game has been re-invented to be easily-transportable, kooky and eco friendly. 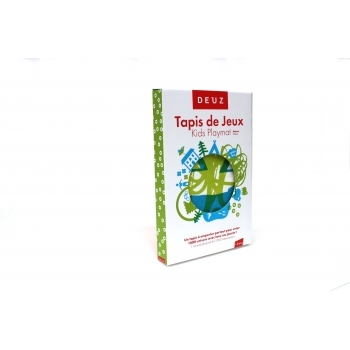 Comes with rules translated into 6 languages. Want to visit a museum, go to the market or simply stroll through the city ? 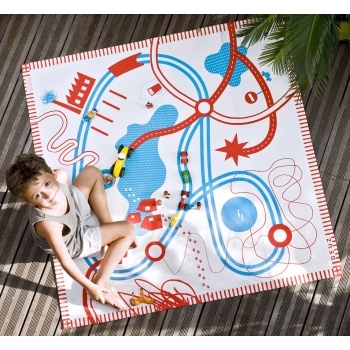 This colorful playmat is a wonderful way to encourage children’s imagination. You can easily pack the mat into their small bags and can be used indoor as well as taken to the park. 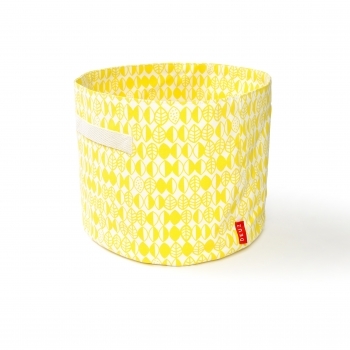 In this yellow medium sized case mommy can pack all her essential nursery items or you can use the pouch as a vanity bag. Kids can put all their pencils in it. So the perfect allrounder. 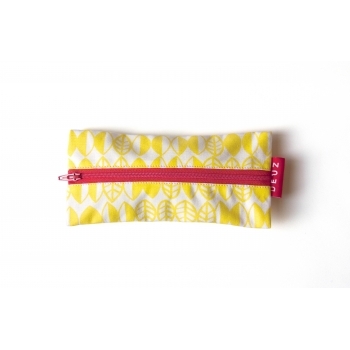 This small yellow case is perfect for your kids to store pencils but also to hide smaller toys and other treasures. They will love to take the case everywhere with them. Kids simply love to play and to hide in tents. 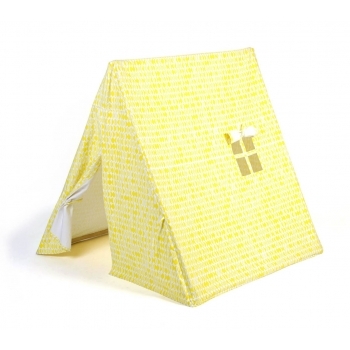 This lovely tent is printed with yellow leaves and will brighten op your kid's room. Easy to build, easy to dismantle and it comes with its own storage bag. 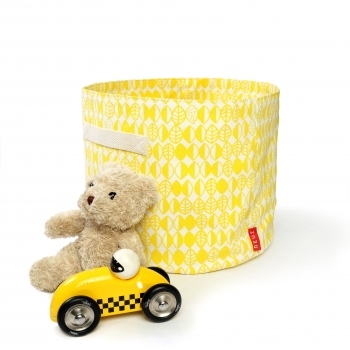 This mini beddy-bye bag with yellow leaves for dolls and teddies is the perfect gift when your kid loves putting them to bed. 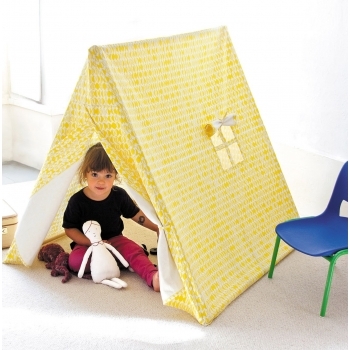 It has a sleeping bag and a pillow and will become one of your kid's favourite toy accessory. Available in different colours. 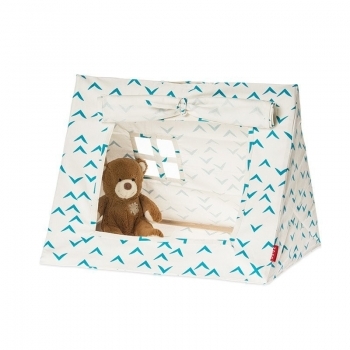 Hide your teddy bears or put your dolls to sleep in this lovely toy tent. It is easy to carry and the assembling will be done in no time. 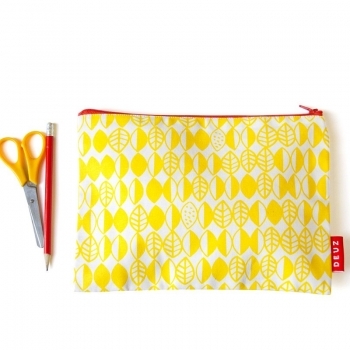 The mini tent is printed with yellow leaves and comes with its own storage bag. Use it in the tents or as a playmat for your kid. 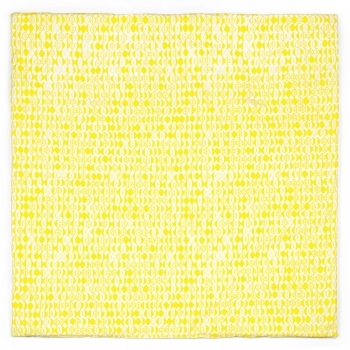 They will love to spend their reading time as well as their nap on this super cozy yellow mat. The perfect companion from birth on. 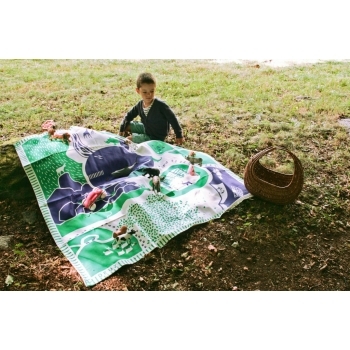 The mats are made of organic cotton and printed with non toxic inks. Made in India by a fair trade company. Other colours and styles available.